Tiffany Grant delivers fresh perspective on waiting for Mr. 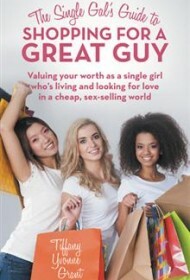 Right in her fun and energetic book The Single Gal’s Guide to Shopping for a Great Guy. Grant’s clever analogies compare dating to various shopping situations and encourage single women to respect and value themselves, live celibate until they are married, and shop for men God’s way. Very little mars the sparkle of this book. Sometimes she stretches a bit to hold to the shopping theme, but readers will forgive this. (As an aside: As she unravels the connections to dating she’s also giving incredible shopping advice!) And some may find Grant’s standards too high and fear no man can meet her demands. But Grant trusts God as the “Almighty Matchmaker” and promises that “if you date God’s way, pray and listen…He will let you know if you have really found” Mr. Right. Grant’s motivating spin on the dreaded single life is encouraging and will be passed around from girlfriend to girlfriend. Her careful, clean wording makes this a great read even for older teens. It’s a must-have for any Christian single woman feeling hopeless about not having a ring on!